Jerry Fletcher, describing collectivist social conditioning, in Conspiracy Theory. While the terms patriotism and nationalism can refer to the same thing – the love of one's native country – in practice they have acquired very different meanings. Nationalism, in practice, describes not to the love of a country but rather the veneration of its central government. Patriotism is not built on zero-sum assumptions: It is quite possible to love one's country ardently, while recognizing and respecting the love that patriots of other countries display for their homelands. I am convinced that one result of a global pandemic of genuine patriotism would be a general abatement of warfare, since people who really love their country would spare it the horrors of war in all but the most exigent of circumstances. Authentic patriots thrust into combat against each other would be likely to seek the earliest possible end to conflict, as well as to pursue a just and sustainable peace. The objective, after all, would be to preserve what's best for one's own country, not to impose the will of one's government on another country. It takes relatively little prompting to teach an individual to love his country. It requires a considerable investment of time and effort to indoctrinate him into the love of the State that rules him. The former can be taught in the home by parents who have a decent grasp of their country's history and culture. The latter, however, requires the efforts of the state's paid clergy.. Typically, an individual doesn't need prompting to love his family, even if there are some within it he doesn't like very much. Familial affection is not the product of ritualized peer pressure, like pep rallies and similar liturgies. “School spirit,” by way of contrast, is an entirely synthetic pseudo-emotion. Public schools are about as organic as polystyrene, and the “communities” they create are the product of geographic accidents and arbitrary government decisions. They have those traits in common with the “nations” brought into being by the Power Elite after World War I. Like those artificial “nations,” public schools compensate for their lack of community authenticity through the cynical propagation of convenient myths and the state-managed manufacture of ersatz enthusiasm. Last fall (for reasons I'll explain below), my wife and I found it necessary to put our three oldest children into the local government school, whose mascot is the Pirate (an appropriate choice for a government-run institution). As a result we became aware of the school district's incessant efforts to instill “school spirit” in them – through competitions involving the sale of Pirate t-shirts, or classroom participation in “Pirate Fridays” by wearing the school colors. None of this has anything to do with athletic competition; we're discussing an elementary school here. So why is there such an effort underway to confect “school spirit”? I suspect that teaching students to revere their school is the first stage of indoctrinating them in the state-worship called nationalism. “Be true to your school” is the first line of a catechism that concludes with some variation on the theme of der staat uber alles. As Gary North observes, this is nothing new: “Throughout the West after the rise of Napoleon, nationalism became the State's substitute for organized religion. The public schools universally inculcated some form of State-deifying nationalism.” What North describes is Rousseau's Civil Religion, in which the State -- as the instrument of collective human power -- is treated as "God." Since the State is an abstraction, it is the most visible representative of the central government – in our case, the president – who is deified as the State Incarnate. 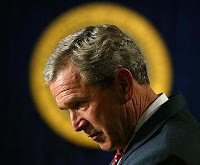 As in the early Roman empire, our presidents are generally deified after death: Witness, for example, the revoltingly blasphemous depiction of Washington' apotheosis (literally, “ascent to godhood”) in the national Capitol, or the routine depiction of Lincoln as “the martyred Christ in democracy's passion play,” as neocon Walter Berns puts it. In this, as in so much else having to do with executive despotism, the beady-eyed, slack-jawed, bloody-handed, illiterate little troll in the Oval Office has turned over new ground: He claims to commune with the Shekinah, or divine presence. How much of this is narcissism, and how much is a serious psychological disorder (I do not say that flippantly), it is difficult to say. The truly terrifying thing is that the purpose of government schools is to catechize the young in an official religion that would make them accept such grandiose claims without so much as a tremor of critical thought. So the question must be asked: Given what I describe above, why are my children in government schools? The answer is this: My wife Korrin is seriously and chronically ill. She has been hospitalized four times since last April, and – my soul is grieved to report – she appears to be headed there again. Her condition makes it necessary for me to work at home, in order to care for both her and our children; this severely limits my career options. "Fairest of form was this queen, glinting and grey of eye; No man could say he had seen A lovelier, but with a lie": Korrin and I on our wedding day, January 10, 1997. There are other schooling opportunities available, but they were cost-prohibitive, even before I was fired by the, ahem, heroes currently running the John Birch Society for no defensible reason (thereby losing both a steady income and our family's health insurance coverage). We don't plan on keeping our boys in school for any longer than necessary. I have no idea how long that will be, but – God willing – it won't be much longer. Please forgive me for bringing up personal matters of this sort. Out of a desire to avoid being a hypocrite, I'd largely avoided writing about the government school system until now. Be sure to visit The Right Source for news, commentary, and -- coming soon -- Will Grigg's Liberty Minute. As a man of God yourself, I assume you communicate frequently with the Heavenly Father. Could it be possible that Mr. Bush DOES communicate with God, but chooses odd or even contradictory ways to implement God's policies on Earth? Perhaps God has shown Mr. Bush good and evil, and yet he has made the wrong choices in acting upon this knowledge anyway? Mr. Bush is a human, he seems liable to misinterpreting a correct course of action after observing a given set of facts, just like anyone else. I'm not exactly defending him or saying he's right, I am just wondering if he is necessarily psychologically disturbed as you put forth, that's all. War doesn't seem like a goal of God's though, so maybe it does take a crazy man to communicate with God and do the opposite of what he says. I am truly sorry to hear of your wife's illness. I hope she recovers quickly and that you are able to remove your children from the government indoctrination center very soon. Prayer sent up regarding your wifes illness and for God's will to be glorified by whatever he has in store for you and your family. Also that you and all your family will be strengthened by this trial to greater sanctification by it. I've been telling people for years that I love my country but I'm really starting to hate my government. I hate to quibble, Mr. Grigg, but from a chemistry standpoint, polystyrene, a polymer of styrene (vinylbenzene, C6H5-CH=CH2), is very much an organic (carbon-containing) compound. I recognize you mean "organic" in the sense of "natural" or "indigenous" - those might be better words to use here. Thank you so very much for showing us your lovely wedding picture. 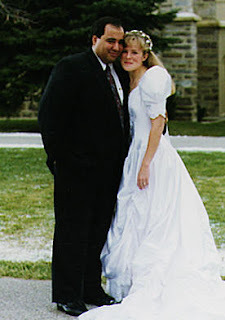 My husband and I were married on October 11, 1997; he asked me to marry him on Valentine's Day of that year. My thoughts and prayers are with your family. I pray that your wife will soon be home and healed. We homeschool as well and I understand your aversion to government schools. The "school spirit" argument is fascinating. Thanks so much for providing it. Those children of yours are lucky indeed. School spirit is another term for herd instinct, attempting to make us far less than Our Creator intended. I too am sorry to hear about your wife's illness. I definitely agree with the views you have expressed here on patriotism vs. nationalism. I wanted to homeschool for years and years but without support from my other half, out of fear more than anything else, it was just a pipe-dream. Now that we've finally cut the cord with public school I can see that its better, not necessarily "easier" or "convenient". So having said that I have full sympathy for your family situation. You make do with what you have while faithfully praying for better. Difster... You here? Good to see you around. I don't love my government in the slightest. Its an evil that I deal with only in the most cursory way. I'm only happy when I don't have to deal with or even think about it at all. The truly sad thing is when I expressed this kind of view to some Christians they looked at me as though I'd commited the unpardonable sin. Good post. I never thought about juxtaposing “patriotism” and “nationalism” and examine the concepts in detail as you have done here. There are critical differences indeed. Thanks for the word dissection ;). Yep, I'm here DrFix. I'll be dropping by often I think. Great post on the distinction between the two. I hope and pray your wife will be alright. Keep up the good fight. As a member of the JBS, I am still uncertain as to what took place, but that being said, I do know that you were responsible for much good work, and I suppose it must be remembered that, trust in the Lord will see you through your trials, and tribulations. Were I in your position, I would consider that the Lord has better things for you to do, and it was his will to move you in a different direction. I have faith in our Savior and Redeemer Jesus Christ to apply His atonement to your family trials, and that He will, in the end, provide you with an opportunity to follow Him eternally. It is my prayer for your wife to be ever reliant upon Jesus the Christ for His protective hand in helping you to care for, and support her blessed children until she is able to share that glorious duty with you once again. I know He will bless your family with all that you may need to go forward with faith, and trust in Him. I'm not only sorry to see you have left the New American, but I am also sorry to hear/read about your wife. I will keep you and your family in my prayers. "Coming soon -- Will Grigg's Liberty Minute"
When? In a minute? What is a liberty minute? The "Liberty Minutes" are 60-second radio editorials I've been doing for about a month. As soon as we're able to, we're going to offer an archive of those spots on The Right Source. I wish to express my earnest thanks to those who have offered prayers on behalf of Korrin and our family. We're still not sure how things will turn out, but at least for now she hasn't had to return to the hospital. The hospital costs without insurance must be astronomical! What does everyone on this blog think of starting a type of "money bomb" donation to Mr. Grigg to help with the medical costs, with a website link to donate? Wouldn't this be true faith and brotherly love on our part? Don't we need to start loving our brethren in need? I'm not computer savvy, so could someone provide the link and a way to donate? We could also email a link to this blog and donation website to all our friends who might also want to help with a contribution to Mr. Grigg and his family. This is truly a situation of dire circumstances. Thank you to all here for loving one another as we need to do in these perilous times. What doth it profit, my brethren, though a man say he hath faith, and have not works? can faith save him? If a brother or sister be naked, and destitute of daily food, And one of you say unto them, Depart in peace, be ye warmed and filled; notwithstanding ye give them not those things which are needful to the body; what doth it profit? Even so faith, if it hath not works, is dead, being alone. 18 Yea, a man may say, Thou hast faith, and I have works: shew me thy faith without thy works, and I will shew thee my faith by my works. Is there an address I could mail at least a small contribution for medical costs or toward help with homeschooling your children? I'm sick myself and unable to work. Nevertheless, the Lord has blessed me with those who have reached out to me in times of need. The Lord wants all of us to pass His kindness on. Please let me pass on that blessing to you. eagles fly -- I'm deeply moved this morning by your kindness and generosity. If you're in poor health yourself, please take care of your needs; we're still digging our way out from beneath our medical bills, but we're otherwise doing all right at present.